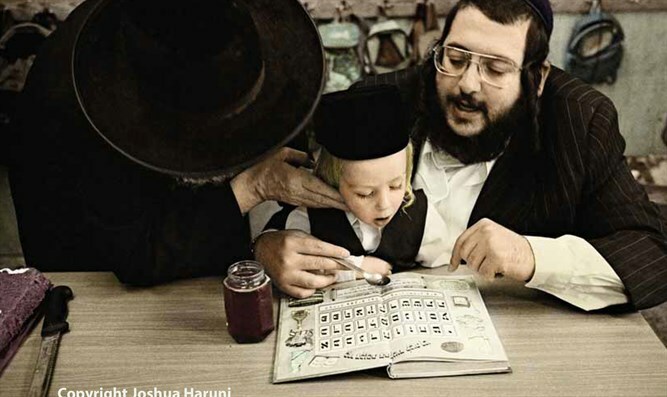 London-born Jerusalemite Joshua Haruni spent eight years photographing the world of hassidic Jewry kept far from the public eye. The results are gripping and visually enchanting. Do not photograph! (Yiddish title: Mach nisht kayn bilder ) by Joshua Haruni looks like an attractive coffee table book and certainly weighs as much as one, but it is a work of art you will find yourself leafing through again and again, stopping to mull over different scenes each time. The inner courtyards of hassidic Jewish life and the undertones of mysticism in hassidic study are private and not open to photographers. Hassidim do not want to be the subjects of superficial and supercilious anthropological analysis and many do not allow themselves to be photographed at all, deeming photography a transgression of the Ten Commandment prohibition "You are not to make an image or picture of anything in heaven or on the earth or in the waters under the earth." Haruni, however, after years of patient efforts, was allowed to photograph a hassidic community in depth over a period of eight years. The book is proof that the community's trust in him was well placed, its impact compelling. The book was sent to me by the publisher for reviewing and as I slowly turned the pages of authentic, unprecedented – and hauntingly hued – photographs of hassidic life, I wondered for a moment whether to tell the publishers they had turned to the wrong person. The book is meant to grant a glimpse into a strange, very different world than that of its readers. But I felt totally at home, the way I feel in the stringently haredi Geula and Mea Shearim neighborhoods of Jerusalem, because I was raised in that world, it is part of my soul and its codes are internalized. Of course, I hardly resemble a member of the closed society of Pinsk-Karlin, photographed often in the book, but my family is "hassidish," with a number of brothers-in-law, nieces, nephews and cousins ranging from virulently anti-Zionist Satmar to Bobover and others. I remember the feeling of sanctity at the Kapichniizer (a hassidic court in the book) shtiebl near my home and at seeing the Zablotover Rebbe bent over his sefarim (holy books) next door to us in my lower East Side birthplace, the joy of the Stolinl-Karlin Simchas Torah dances. My beloved father z"l wore a gartel and went to the mikva every morning, would not pose for photographs (mach nisht kayn bilder stops here), our home was imbued with a hassidic atmosphere. Full disclosure: I did not rebel, but gradually moved into Zionist religious circles and college, but since I continued to be observant on the same level as before, there was no conflict with my wise parents. On the contrary, my father was an ardent hassidic Zionist himself, who strongly disapproved the Israeli government's lack of faith, but whose eldest daughter and her IDF wounded veteran spouse went on aliya in 1950 with his blessing. The book's photographs could have been taken from my childhood - and what beautfiul photographs they are! Looking at the photos brought memories to life. I attended many weddings where brides covered their faces with an opaque dektich (I had a partial one) rather than a veil, excitedly watched mitzvah tantzen in the brides' honor, attentively following the badchen (the singer who writes and chants personalized Yiddish poems for each person called up to dance) and had a modified one at my wedding - to a Yeshiva University graduate. Little boys licked the honey off the holy letters of the aleph bet when they began to learn to read and I shlugt kaporos with live chickens rotated over my head before Yom Kippur. None of it seemed "picturesque" or "peculiar" to me then, nor does it now. It is a self-contained way of life in which I sometimes take part, and this book does it justice. The photographs present an intimate portrait of this world, by definition more permeated with Torah than ours, because there is nothing else but Torah in it. 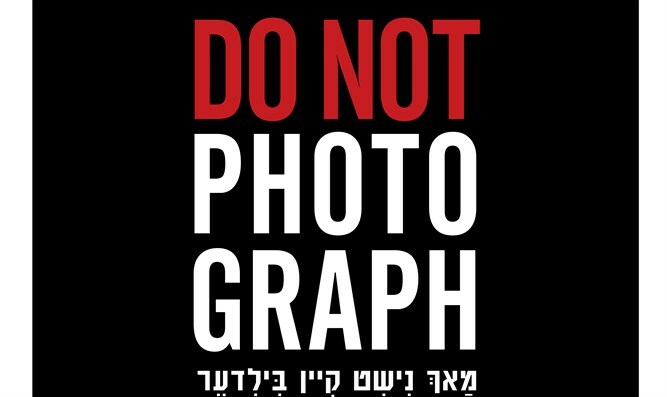 The Religious Zionist sees the world through the lens of Torah, so that his career choice, for example, either enhances (Religious Zionist scientists feel that their research is part of loving and fearing Hashem) or stays true to Torah ('sanctifying G-d in the workplace'), but in the Do not photograph! world, Torah is total, Torah is life. That is it in a nutshell. There is no need to reconcile the modern world with Torah, no finding permission in the Torah for things that are new or questionable, no need for leniencies. No changing women's clothes and hair covering and finding a mathematically logical permit for single mother families. The questions don't arise if you remain in the community. Torah is not logical, not an intellectual pursuit, it is all-embracing. Modern religious Jews are as strange to hassidim of this nature as they are to us. They don't see the need to ask why in their self contained society, with its rites of passage that are the main goal in life: marriage, children, bris, upsheren (first haircut for 3 year old boys), starting to learn Torah etc., the main source of joy, opportunities to get closer to Hashem by observing His commandments. Older readers might react with either nostalgia, curiosity - or distancing - to the book's content, apart from its aesthetic appeal, depending on how much they know or have experienced of the hassidic world. But how would young Israelis, self-assured Sabras, see it? Would it seem like a photographic trip to a different planet? To find out, I showed the book to two young religious Zionist Israelis whose connection with hassidim, other than some distant cousins, consists of visits to hassidic neighborhoods on school trips and seminars whose theme is finding common ground for all Israelis. One is a senior in an intellectually oriented high school with a high level of Talmud study, and is going on to a religious Zionist yeshiva program next year. To my delight, he was spellbound and also drawn in emotionally – he loved the atmosphere of purity the album creates, he related to the customs (which are definitely not his, but make sense to him) - and said that the love of Torah and desire for sanctity his group shares with the hassidim makes him closer to them than to the less observant among the Religious Zionsts. More is better, he said, eyes shining. The second reader is an ulpana (religious high school) graduate doing National Service at present and taking active part in the varied opportunities open to Religious Zionist young women: Dancing in an all girls' troupe (that performs only for women), attending all kinds of concerts, enjoying hikes, she did advanced maths in high school – a life that is an antithesis to that of the hassidim in the book and unacceptable to them, although it is an observant one. She, too, was fascinated, not estranged (as I had expected) and turned the pages slowly one by one, savoring them, especially the children. "First of all, in my opinion, his work is awesome," she begins. "The photographs are full of sensitivity and show the photographer's open attitude to the closed, carefully guarded world of hassidim. He is clearly interested in his subjects and photographs minor, transient moments with no evidence of a judgmental attitude towards the social group he is photographing. 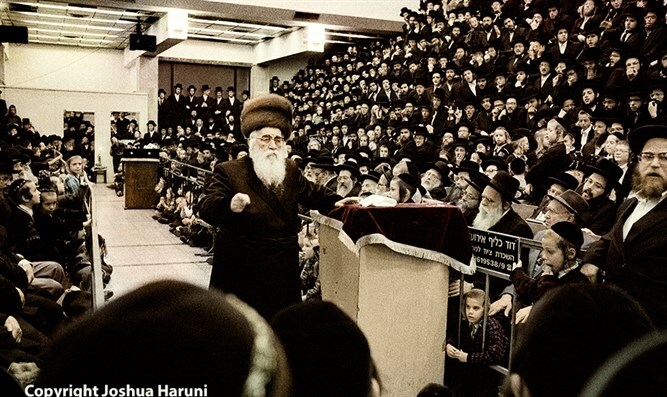 "They are surrounded by hassidim who seek to be close to the Admor, seek spiritual as well as physical closeness. The book concentrates on the facial expressions of the hassidim. Interestingly, although they are members of a social group in which everyone is dressed identically, acts the same, observes the same customs - the photographer often attempts to focus on one person in each group. "For example, in a photo taken at a 'tish' (post dinner celebration at the Rebbe's), in Pinsk-Karlin, we are directed to one man who is reading psalms. That is where Haruni's sensitivity as a photographer shines through. One facial expression shows with subtle delicacy that even when you are part of a whole, you remain an individual. 'Some of the story is about the objects that serve as part of a world that revolves around holiness: Books, dishes, scissors for halakah (ceremonial first haircut for boys at age 3), challah. A note to the Rebbe handed carefully from one hassid to another until it reaches him. And of course the books in which the texts are hidden. "Some of the photos feature burnt white – shining white, glowing absolute white that shows no details. This is an artistic decision that is seen in the photos of the Bet Midrash (study hall) and Synagogue that I think represents the mysticism, holiness, the sanctity, the aspiration of the hassidim to something intangible, unattainable with human intelligence. "In terms of composition, the book is fascinating, because there is a very interesting, inner and orderly visual composition in hassidic circles and on the whole, much visual monotony. From youngster to adult, there is sameness - in children's clothes, the way they are taught to stand together, including many details that are indistinguishable from one another. But again, the photographer decides to break that one dimensionality by composition that leaves room for the individual. "The hassidic woman is another subject entirely. 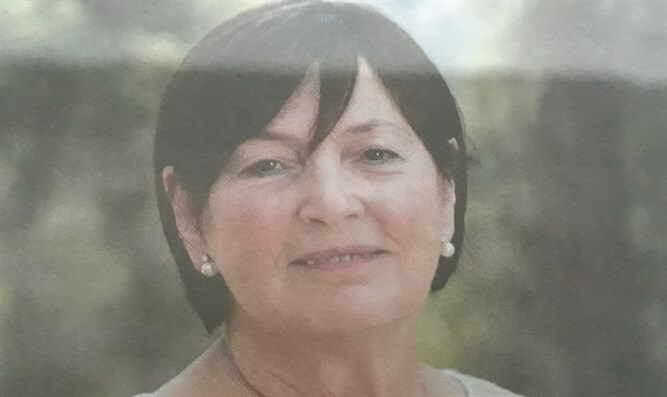 She is not photographed, except when her face is covered in a dektich at her wedding ceremony and then, standing shyly holding one end of a gartel (long black rope belt tied around the waist during prayer) while rabbis are called up to dance in her honor. This is expected in a book that photographs hassidic life. Anything else would be false. And there is much more to say about this fascinating book from a photographer's point of view..."
There is no question that Mr. Haruni took on a daunting and unimaginable challenge in a community where anyone with a camera soon hears someone shouting the words Do Not Photograph! When after two years of patient perseverance, he received permission to photograph the Pinsk-Karlin hassidic court, and did so over an eight year period, he made us all the richer for it.